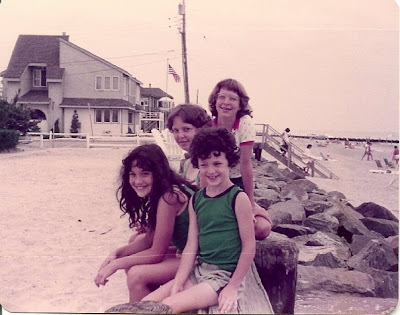 That's me, my brother and my cousins at the New Jersey shore. And that's where I'm going right now, to relive the summers of my youth, followed by Vermont and NYC for some intensive accent retraining. And a complete blogging blackout, so if you're looking for something interesting to read I'll direct you to those industrious folks at the right. I am now officially on vacation and won't be back until mid-August. Don't break anything while I'm away. Love the picture!! Happy hols! Very nice picture! Have a great vacation!